I love Punny and humorous costumes. I try to do one every year. When little kids dress up, they are cute or adorable, right? But when adults dress up, CLEVER is the key! In the past, I’ve been a bag lady (dress made up completely of plastic and paper bags) and even the Pythagorean theorem (a2 + b2 = c2. I was a2 with a blue shirt, my hubby was b2 with a yellow shirt and our baby was c2 in a tie dyed blue, yellow and green shirt). Anyway. 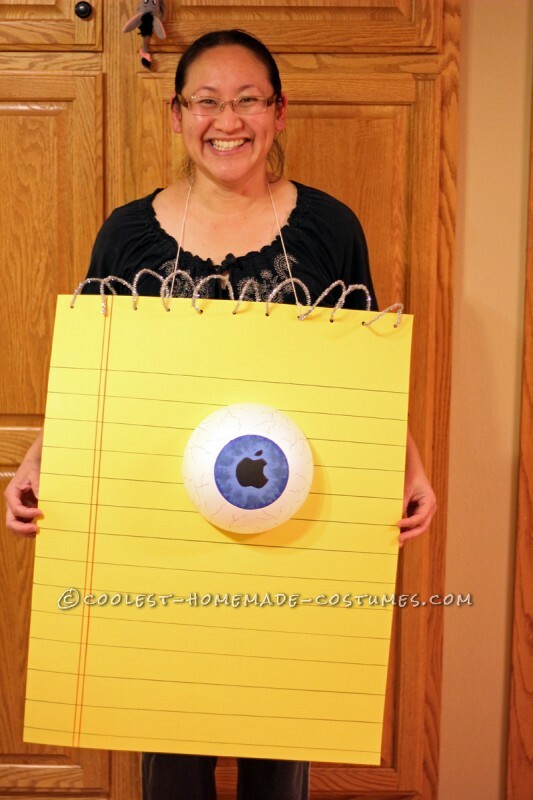 This year, I decided I would be an iPad. I mean, an eyePad. 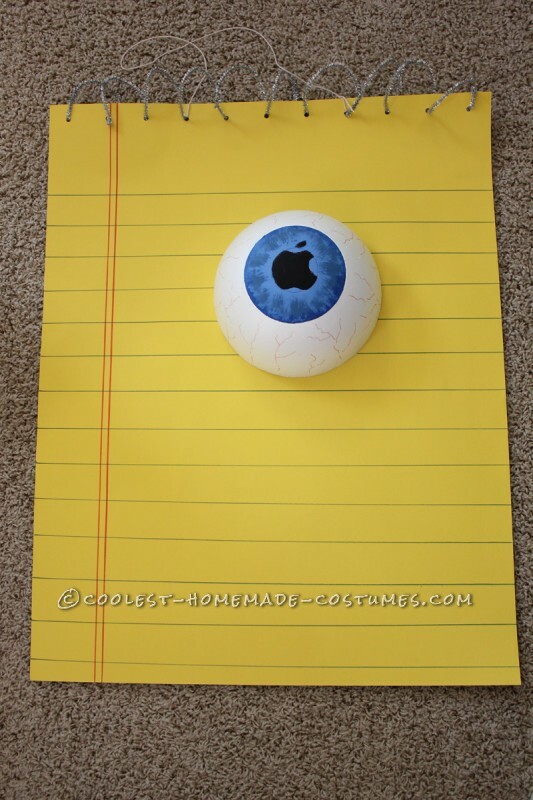 I wore my eyePad costume to a Halloween party and a friend came up to me when the party was winding down. He told me he had had a long day at work and just stared at my costume for 20 minutes before he figured out what it was. Ha ha! It was an “iPad”! I was having some health issues at the time so I needed a pretty simple costume. I made this costume in a couple hours after a run to the craft store for supplies. It was super easy. For the notepad – Yellow poster board, fine tip Sharpies (blue and red), yard stick, hole punch, silver pipe cleaners and string. 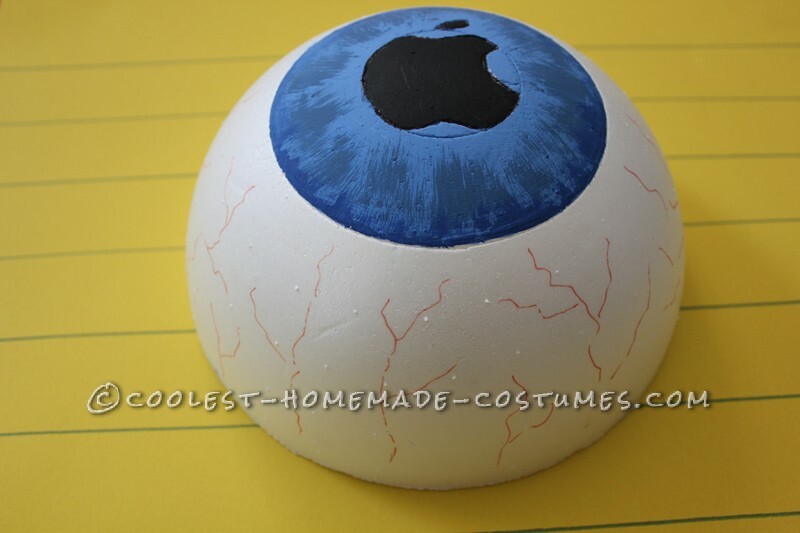 For the eye – 8” smooth white half-spherical foam shape (found at Hobby Lobby craft store), acrylic paint (black and whatever color you would like your eye – I chose blue), sponge brushes, glue, pencil, a bowl and a cup. First off, I had to make the pad part of the eyePad. I opted to go with a replica of a yellow spiral steno notepad. I thought that would be the most recognizable of all the notepads out there. I drew the blue lines horizontally with a fine tip blue Sharpie marker and then the two red lines down the left side vertically. I used a yard stick to make sure the lines would be straight. Make sure you don’t touch the lines till they dry because smudged lines stink! Then I punched holes with the hole puncher in 3” intervals along the top. 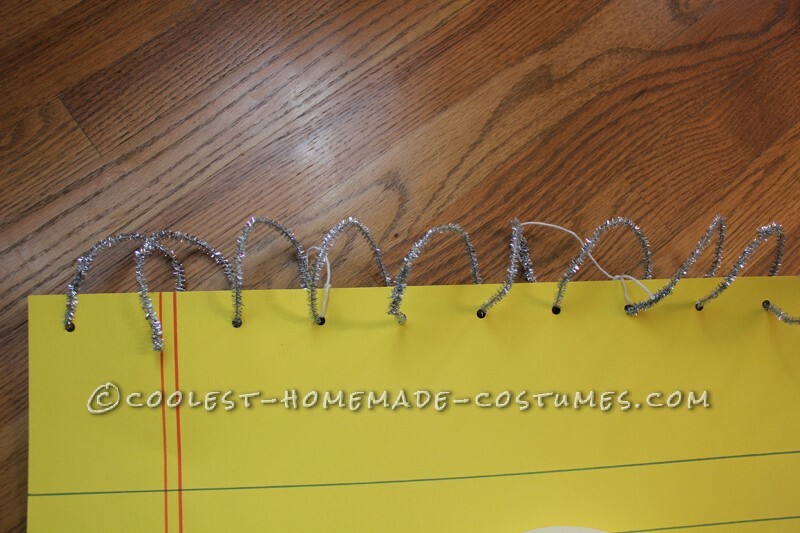 For the spiral part in the notepad, I twisted several silver pipe cleaners together into a long strand and then threaded them through the punched holes at the top. I actually used the empty center of a paper towel roll to help make my loops even. I luckily was able to find an 8” smooth white half spherical foam ball at Hobby Lobby. This costume wouldn’t work as well if it was the bumpy foam. First, I got a small bowl to make the outer edge of the iris. I marked it with a pencil so it would leave a small line in the foam. I found a cup to make the pupil part of my eye. Then I sketched in the Apple logo to act as my pupil. 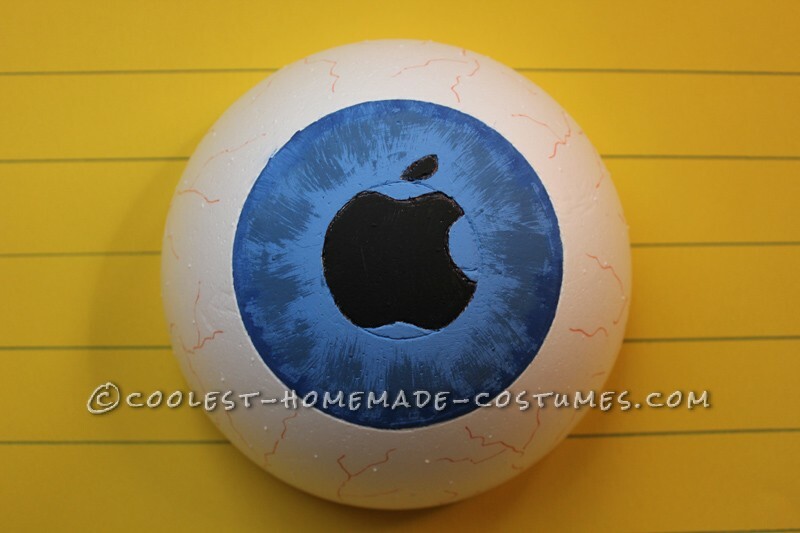 I painted the iris blue and the Apple pupil black. (The pencil grooves really helped keep the paint inside the lines). I then went back after the blue paint dried and mixed in a little black paint into my blue paint to make it a tiny bit darker. I went back with my sponge brush and very lightly brushed the darker blue paint from the outer edge of the eye to the inner pupil to make the eye have a bit more dimension. After everything was dry, I went back and drew in tiny red veins on the white portion of the foam with a fine tip Sharpie marker. Once the eye is complete, glue the eye to the middle of the notepad. I used Gorilla glue and that held up nicely. I also glued the eye a bit higher than centered top to bottom on the notepad so it would be more balanced when I put it on. Close up of the eye! You can see the grooves where I marked the circles with pencil. Get a load of those eye veins! Tie some string on the poster board and measure out how far down you would like the poster board to hang in front of you. Voila! You’re done! Last but not least, the little kids will not get your costume. But they will run up to you and say you’re a giant eyeball and that is pretty fun too because they think that giant eyeballs are cool. The adults will think you’re a riot! Or groan in agony from the punny-ness of it all.